AiRealistic is a site-specific aerial theater company. They bring stunts and live theater together to create a dynamic form of entertainment for corporate events and theatrical productions. They specialize in unique flying solutions, combining rock climbing and sailing technologies with the art and rigging of traditional theater. The result is a very flexible organism that makes any production fly. They also offer aerial classes through their Airealistic Circus and Flying School. As an Aerial Dance Company, ARISE creates unique works of Aerial Art for local community, outreach and charity events within a positive, family friendly and uplifting structure. In addition, ARISE supports Aerial Experience Productions in casting for professional shows around the world including the annual Christmas tour of Churches across the USA. 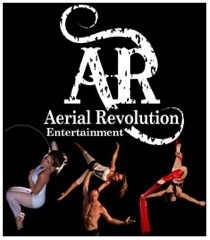 Aerial Revolution is San Diego's premier aerial arts and entertainment company. Constantly providing performers and shows to theaters, nightclubs, and corporate clients, Aerial Revolution has become the source of entertainment in San Diego. In 2010 they also opened San Diego's biggest aerial arts and acrobatics facility called Studio Revolution (StudioRevolutionSD.com) where countless classes are offered daily in all aerial-arts and acrobatics, as well as yoga and dance. Come explore their playground for circus arts, and be a part of San Diego's hottest fitness experience center.